Refilled cartridges are just as they sound. They are previously used cartridges that have been refilled with new toner. 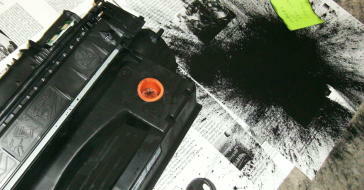 In many cases, this simply involves drilling a small hole in the cartridge and refilling it with toner powder. The process is often referred to as “drill and fill”. The problem with this process is that plastic shavings from drilling can drop into the toner chamber, which can cause damage to the printer toner cartridge, and sometimes even your printer. If the cartridge isn’t sealed correctly, it could even leak or spill causing a huge mess. Some shops that handle the refilling process may use toner that is not up to the quality standards of the manufacturer. If the toner powder does not melt at the proper temperature, for example, it could work incorrectly and produce poor print quality and even cause damage to the machine’s internal components such as the fuser or roller. Many third parties that sell refilled toner or refill kits don’t offer the same quality guarantee as the manufacturer, or even the same guarantee you will often find when purchasing remanufactured toner cartridges. If something goes wrong with the cartridge or the kit, you may not be able to return it, and even worse, you may be stuck replacing your printer if it was damaged. On the surface, the cost savings of refilled cartridges might seem worth the risk, especially when they are available at much lower prices than OEM versions. But this is not the only alternative. Remanufactured toner cartridges are those that have been previously recycled. They then go through the remanufactured printer toner process. This is a much more thorough process that includes inspection and replacement of any worn or faulty parts, carefully opening the cartridge with specialized tools, and refilling it with high-quality toner. The best part about using remanufactured toner is that the price is much lower than OEM alternatives, but many sellers also offer a satisfaction guarantee. These cartridges meet or exceed the quality of their OEM counterparts, and still help you save money while avoiding the drawbacks of simple refilling. The result is an affordable and reliable solution to the high price of toner cartridges.